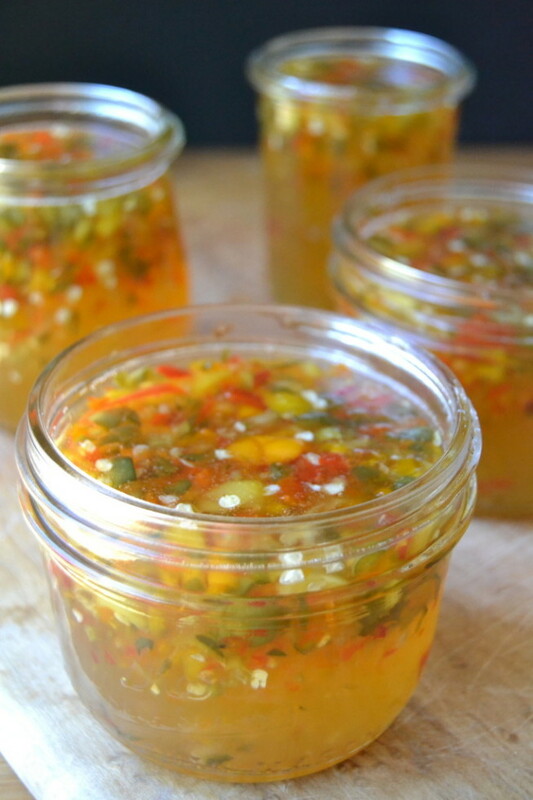 I have a ton of peppers ripening all at once, so I made a lot of pepper jelly. I'll post a recipe, but I just used the recipe on the Ball Pectin package, using a random mixture of bell peppers, nardello peppers, italian peppers, with a couple of jalapenos mixed in. Next time I won't be so shy with the jalapenos. So the pepper jelly (I bet you have a jar in your cupboard) is one of those things you never really know what to do with, and save, knowing you can spread it on cream cheese and any cracker and have something to serve with drinks. So I came up with a couple of things to do with it, and one of the best, is just using it on a PB and J sandwich (PB and PJ)! Also; mix a big spoonful into the next vinaigrette you make. But then I had the idea to put it in a traditional jam cookie, and had just read about this shortbread from Baking with Julia by Dorie Greenspan (Morrow, 1996), which uses a different method of making the pastry that does not require rolling it out. Instead you freeze it and grate it into the pan with an ordinary box grater. The recipe is great if you want to make it as she does with Raspberry Jam, or you can sub in any nice jam or preserve, but the Pepper Jelly version is wild and wonderful. Using a sieve over a bowl, sift together flour, baking powder, and salt; set aside. Cream butter in a large bowl, using a hand mixer on high speed, until fluffy, about 2 minutes. Add sugar and egg yolks; mix until sugar is dissolved and mixture is light, about 4 minutes. With mixer on low speed, slowly add flour mixture; mix until dough just begins to come together, about 1 minute. Turn dough onto a lightly floured surface; bring it together with your hands. Divide dough in half and form 2 balls. Wrap each ball in plastic wrap; freeze for at least 30 minutes or up to 3 hours. Arrange an oven rack in center of oven; heat to 350°. Grease a 10" springform pan with butter.